Nature Crafts R Us...we just love them! More than ever we need to get our children in touch with nature. Nature crafts and nature art are a window into our natural world for kids who live in the City. It seems to be all about school homework and computer games that take up their time. Not good! The motto I`m adopting for this website is "No Computer Games Allowed!" We`re willing to give the green light for computer art though. 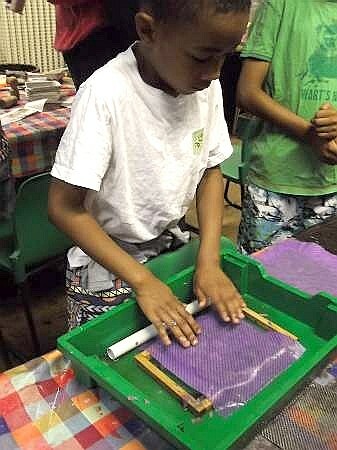 How about a day with The National Trust making wild flower seed mats? This summer is awesome and great for getting outdoors doing nature crafts. 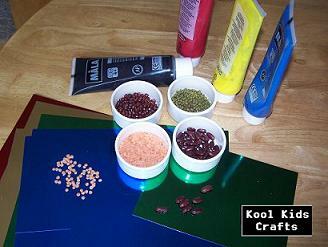 Not only will you learn how to make seed mats, but seed pots too. Take a hike over to the page and see how the KKC crew went about making there`s. The National Trust look after out green spaces and help children see how important they are to use. They have set up many different programs you can get involved with during the school summer break. So what hands-on projects have we in mind to counteract the zombifying computer games? What can we do in the city? A lot! Mini gardens and creating mini wildlife creature habitats are ideal models for our particular environment. You can do your part for the "Create a Certified Wildlife Habitat" development by gardening with kids, although you have to register yourself to be a part of that. I have just bought a couple of candy jars for Iain and James to make plant terrariums... and for me too! I would love one in my office. This will be an ongoing project but the nice thing about it is that it requires low maintenance, leaving us free to just enjoy them. 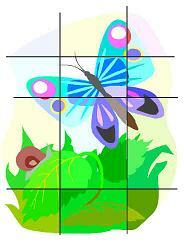 How about a Butterfly Project? 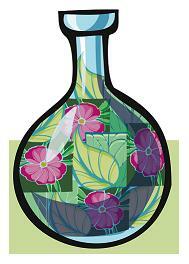 It`s good that we chose tightly closed terrariums. Why? Well one of the suggested kids crafts that got the thumbs up from Iain and James was to sustain a butterfly garden. It involves feeding caterpillars and watching the metamorphoses process of changing into butterflies. We wouldn`t be too happy to find them munching through our newly planted mini gardens, now would we? The weather is still a bit cool yet to send for the caterpillars, but hopefully by mid June we can go ahead and get busy with both nature crafts. 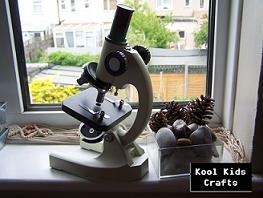 We have a microscope tucked away somewhere and it`s time to get it out. The streams and ponds will be teaming with micro wildlife by now. It`s great to hear the boys react with glee as they peer through the lens and see those cyclopes micro monsters jerk about. We`re gonna make some drawings of what we find. Great for a collage. In fact a micro nature theme for a collage sounds like real fun. We could do some bark rubbings and work on leaf vein crafts and make a forest collage! The ideas are endless! You know not all nature crafts have to be living. You can do a lot with dried seeds, beans, flowers, and leaves. Even egg shells have great potential and can bring out the artist is us. We look forward to making some awesome seed greetings cards of a mosaic theme to inspire you, and turn our hands to modelling clay using seeds and beans for decoration. We will be inviting you to show off your great works of art. I am really looking forward to that and Iain and James too! Let`s begin with a simple fish mosaic made with seeds and beans.